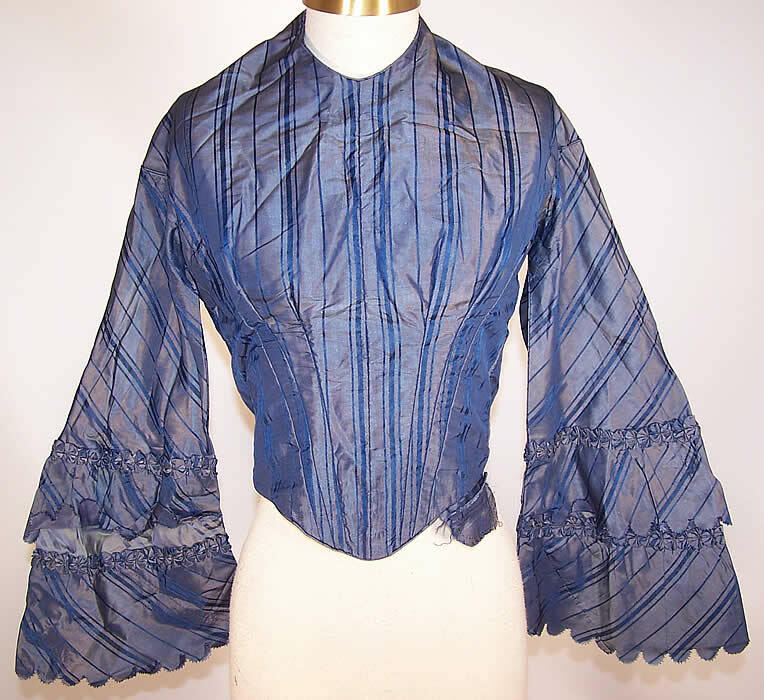 This antique Victorian era iridescent cornflower blue silk stripe pagoda sleeve bodice top dates from the 1850s. 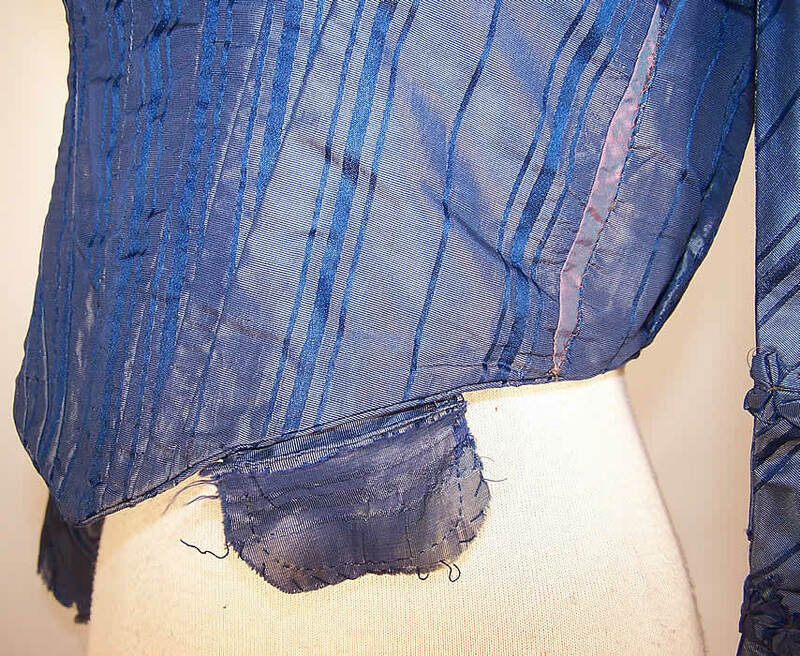 It is hand stitched, made of an iridescent light cornflower blue color silk fabric, with a striped pattern design. This beautiful bodice has a rounded high neckline, with long layered scalloped ruched ruffle flared bell shaped pagoda style sleeves and a blunt point dropped waist on the front with an attached small coin purse pouch pocket. It is fully lined in a cotton twill fabric, with brass hook & eye closures down the back. The bodice has a 22 inch waist and 32 inch bust. It is in excellent wearable condition, with only some faint underarm discoloration and slight age spotting on the inside lining. 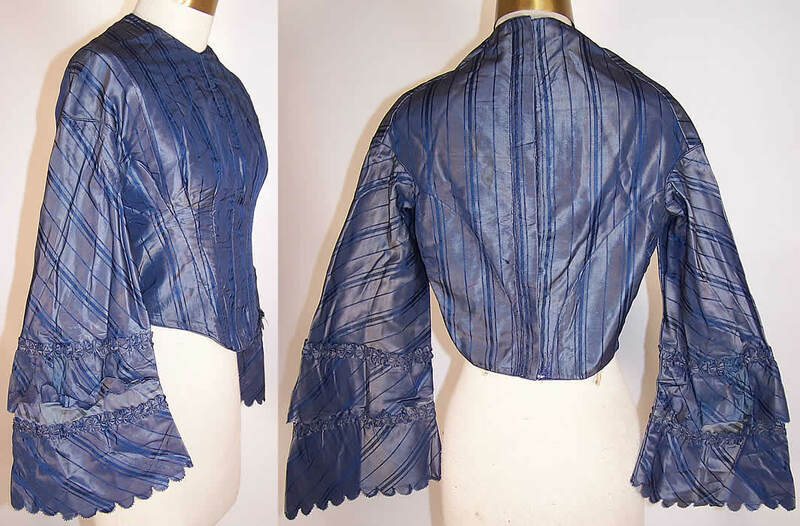 This a wonderful piece of wearable early Victoriana and a rare find! Ditto! Except that the pocket is for a watch, not coins. There are lots of CDVs that show ladies with watch chains but no visible watch. 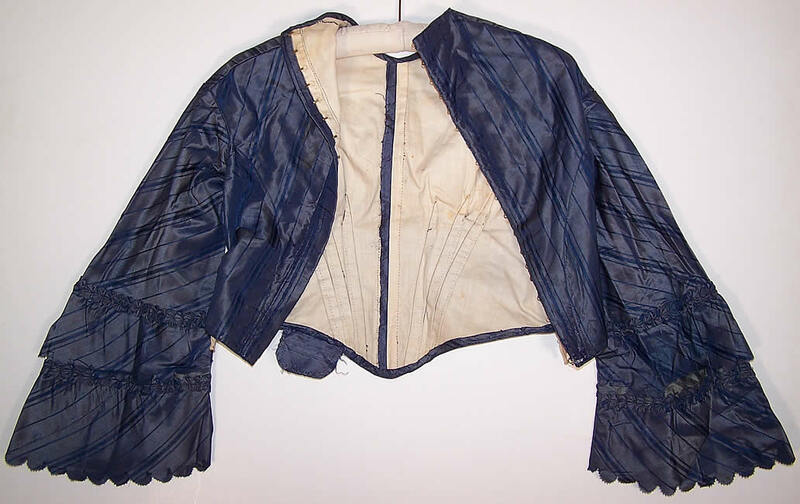 How interesting to see it attached just to the bodice, with no skirt! No doubt the voluminous skirt was cut up into another gown at a later date. Very pretty pinked scallops on the sleeve flounces, too. That's one feature that is pretty tricky to reproduce these days. oh, I know! I've been trying to find a pinking tool or scissors with very little luck. I'd love to get a better inside look of this bodice to see where the skirt was attached. No lady would have her pockets out like that!